This Graeco-Roman temple was first initiated by Ptolemy III with numerous additions by subsequent Roman Ptolemaic rulers. The Ptolemaic period (305 - 30 BCE) refers to the period of time in which Egypt was ruled by a succession of fifteen Hellenistic rulers all sharing the name of Ptolemy. The policy pursued by Alexander the Great (332 - 323 BCE), in which he portrayed himself as an Egyptian ruler, appears to be have been followed by his Ptolemaic successors. Many Egyptian temples, including those at Dendera, Edfu, Esna and Kom Ombo were either rebuilt, repaired or newly founded during this period. 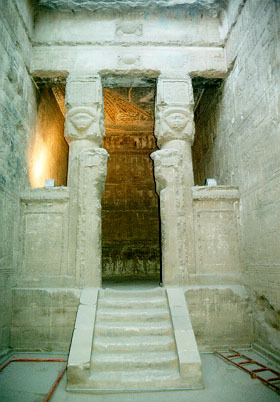 The main entrance of the Temple of Hathor as seen from the mammisi. 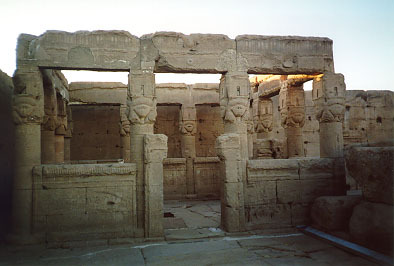 It is a comparatively small propylon-style gateway rather than a large pylon as in most other Upper Egyptian temples from the New Kingdom onwards. 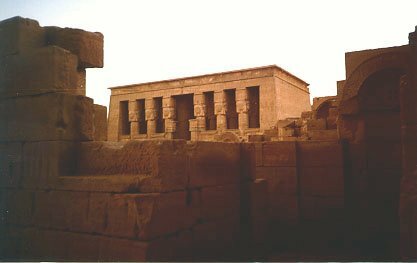 The temple, of Ptolemaic and Roman date, is dedicated to a local form of Hathor who was closely identified with Nut, as sky-goddess and daughter of Ra. 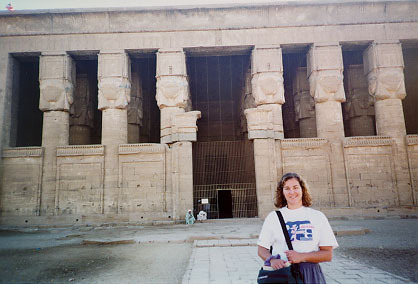 The columns of the facade and outer hypostyle hall of the temple have capitals in the form of the head of Hathor surmounted by a naos-shaped sistrum, a kind of musical rattle associated with Hathor and symbolic of joy and celebration. At Dendera, the Egyptian New Year was celebrated. The theme of New Year's revelry and noisemaking obviously goes back at least this far. Detail of the outer hypostyle hall's Astronomical Ceiling. The continuing cycle of a day is represented by Nut. Her dress is the sky; between her legs is the birth of the sun, which disappears at night as she swallows it. 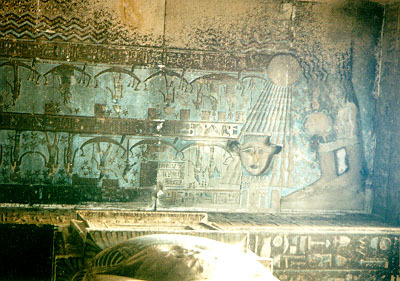 The sun's rays illuminate Hathor. 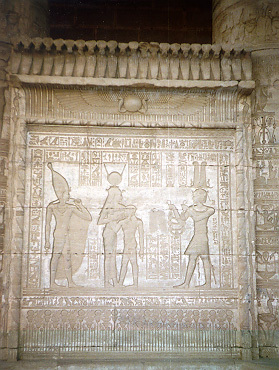 On the south exterior wall of the temple, reliefs show offerings being made to the goddess by Cleopatra VII. This is one of the few depictions showing the most famous of all the Cleopatras. In front of her, in traditional Pharaonic dress, is Caesarion (Ptolemy Caesar), her son by Julius Caesar, who Cleopatra established as her co-regent at the age of four. A number of unfilled cartouches reflect the uncertain political conditions of the first century BCE. 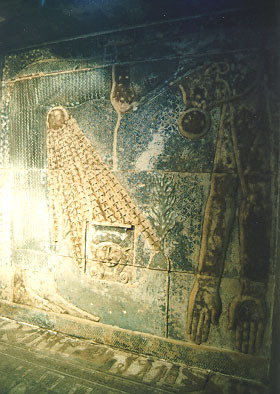 The Ceiling of the Chapel of the New Year showing the goddess Nut swallowing the sun nightly and giving birth to it daily. The sun's rays illuminate Hathor. In one corner of the roof of the temple, a tiny, open topped shrine was used by priests once a year to allow the statue of Hathor to feel the rays of the sun-god, Re. View of the surviving buildings as seen from the roof of the Temple of Hathor. The earliest surviving building is a mammisi (birth-house) on the left-most side of the forecourt, dating to the reign of Nectanebo I (380 - 362 BCE). The second mammisi, upper-most, was built later and is referred to as the Roman mammisi. Between the two mammisis are the remains of a basilica of the Christian period. 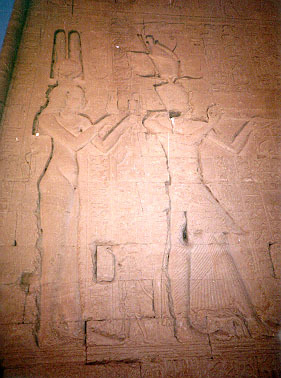 A panel from the Roman mammisi, showing a detailed relief of the pharaoh making an offering to Hathor, who is suckling the young Ihy. 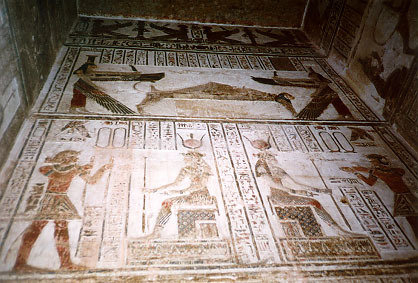 A second Ihy, wearing the White Crown of Upper Egypt, stands behind Hathor. The Roman birth house is the latest preserved temple of its type. It was the ritual location where Hathor gave birth to the young Ihy, who stands for the youthful phase of the creator gods in general.